Chaplains in the U.S. Army fulfill a dual role as clergy and staff officers. As clergy, they provide religious ministry to the members of the command to which they are assigned. They do this either directly, by performing ministry functions themselves, or indirectly, by arranging for others to perform them. Chaplains provide ministry directly according to the requirements, practices, and traditions of their own distinctive faith groups. They provide ministry indirectly by coordinating with other chaplains, lay leaders, or civilian clergy to perform ministry functions to meet the religious needs of soldiers of faith groups other than their own. Definition: The Orthodox Presbyterian Church (OPC) is one manifestation of the church of Jesus Christ and is Reformed in doctrine, Presbyterian in polity, and evangelical in outreach. God has blessed my wife and me with four children, and, like most parents, we have learned that it is not always easy to influence children to change inappropriate behavior. But when you consider how slowly and usually reluctantly all of us who are God's children correct our behavior, it should come as no surprise to us that our children follow suit. Even though our children resist obeying us at times, it is encouraging to see them giving us a good, honest effort to do what we want. God was surely our help last year. The year 1999 was only a few hours old when a chain of events began that would leave us totally dependent upon him. 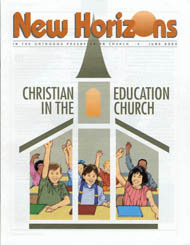 What comes to your mind when you think of "Christian education": a denominational or presbyterial committee? a Christian school? that small "sanctified junk" section of your religious bookstore? the Sunday school? the youth program?